Daraby, B., Jafari, J. (2016). Some properties of fuzzy real numbers. Sahand Communications in Mathematical Analysis, 03(1), 21-27. Bayaz Daraby; Javad Jafari. "Some properties of fuzzy real numbers". Sahand Communications in Mathematical Analysis, 03, 1, 2016, 21-27. Daraby, B., Jafari, J. (2016). 'Some properties of fuzzy real numbers', Sahand Communications in Mathematical Analysis, 03(1), pp. 21-27. Daraby, B., Jafari, J. Some properties of fuzzy real numbers. 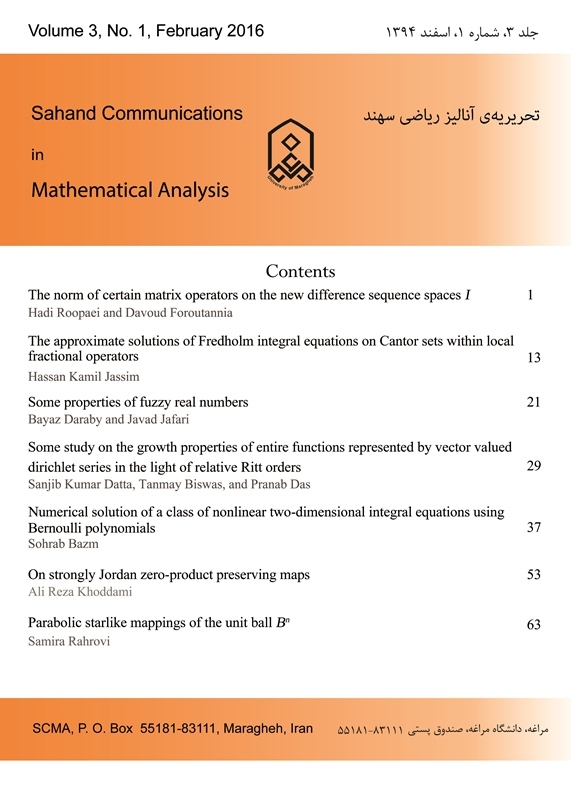 Sahand Communications in Mathematical Analysis, 2016; 03(1): 21-27. Department of Mathematics, Faculty of Science, University of Maragheh, Maragheh, Iran. In the mathematical analysis, there are some theorems and definitions that established for both real and fuzzy numbers. In this study, we try to prove Bernoulli's inequality in fuzzy real numbers with some of its applications. Also, we prove two other theorems in fuzzy real numbers which are proved before, for real numbers. T. Bag and S.K. Samanta, A comperative study of fuzzy norms on a linear space, Fuzzy Set and Systems, 159(6)(2008), 670-684. C. Felbin, Finite dimensional fuzzy normed linear spaces, Fuzzy Sets and Systems, 48 (1992), 239-248. M. Mizumoto and K. Tanaka, Some properties of fuzzy numbers, in: M.M. Gupta et al., Eds., Advances in Fuzzy Set Theory and Applications (North-Holland, New York, 1979), 153-164. W. Rudin, Principles of Mathetical Analysis, Mcgraw-Hill, New York, 1976. I. Sadeqi, F. Moradlou, and M. Salehi, On approximate Cauchy equation in Felbins type fuzzy normed linear spaces, to appear in Iran. J. Fuzzy Syst. 10: 3 (2013), 51-63.